(Victor Valley)– The story of Macbeth is one I think everyone has read at some point and time. The dark tragedy is one of William Shakespeare’s greatest works, and is the jumping point from where Toil and Trouble springs from. This re-imagining of the classic tale comes from the mind of Mairghread Scott, best known for IDW’s Transformers: Windblade, with the artistic stylings of Kelly and Nichole Matthews. This first issue of the mini series puts us right on the coast of Scotland as it stands to be invaded. Three witches watch over it, protect it: the sisters Riata, Cait, and Smertae. Smertae sees the world differently from her sisters, which causes for actions to take place- whether they are mistakes or not remains to be seen. We see a young Macbeth, one who plays a pivotal role, just as Macbeth should. What future will the three witches end up shaping? Scott takes on an ambitious tale, having roots with one of the most famous tragedies in history. What starts off a little slow picks up midway and really leaves the reader wanting more by the end of it. The artwork by the Matthews is vibrant, clean and with an animation like feel to it. The character designs here are spectacular, giving the witches all a unique and original vibe. 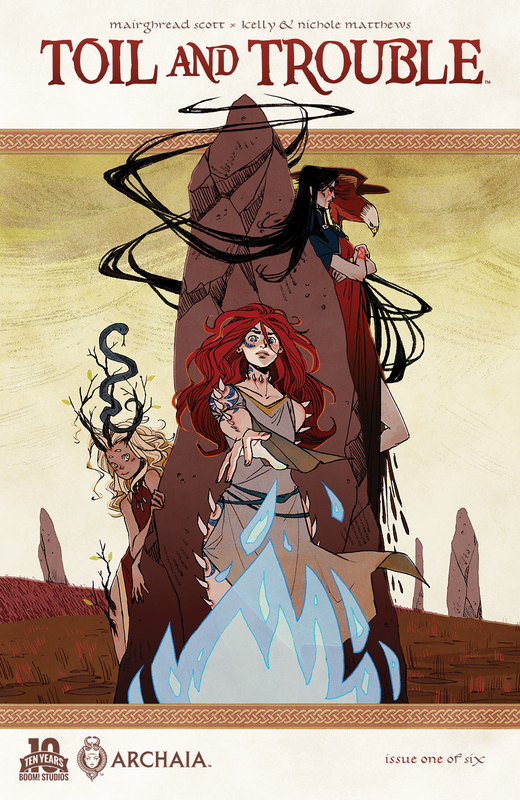 Lets not forget the cover, masterfully done by Kyla Vanderklugt, from Jim Henson’s Storyteller: Witches. Archaia/Boom! has been known for their unique and creative books, and Toil and Trouble is right up there in terms of story and quality. Rating: I give Toil and Trouble #1 a 4 out of 5. The witching hour is among us- hope you’re ready.